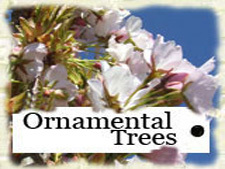 2yr Tree £22.00 +Vat - See for all prices and quantity discounts. The variegated 'Midland Thorn'. Its young leaves are prettily mottled with pink and white. Small sized tree. White turning pink semi double flowers. Large leaf. Very distinctive tree. Medium sized tree. 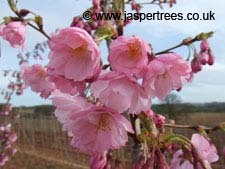 A very graceful small weeping cherry. Single white flowers, pink at first. Remains compact. Small sized tree. Narrow conical habit. 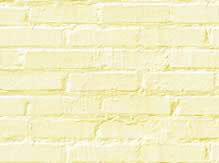 The bark can be polished to a deep sheen. Pale pink flowers in Spring. Medium sized tree. 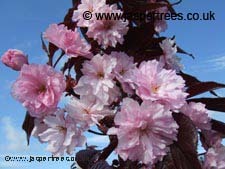 Image Flowering Cherry 'Serrula' showing polished bark. Outstanding small / medium tree. 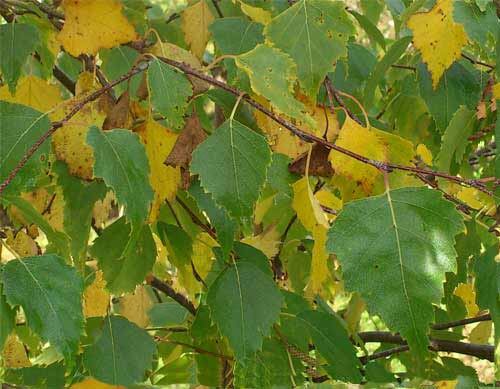 Rich golden yellow leaf from Spring to Autumn. Raised in Holland in 1935 by W. Jansen. Medium sized tree. Interesting Robinia cultivar. Abundant lilac pink flowers in June. Deep green leaves. Medium sized tree. Beautiful delicate, speckled variety. Grafted high on specially chosen stems. Small sized tree.